Zina Saunders is a writer and illustrator who in the last few years has been combining her talents as “reportage illustration” in several series of combined portraits and interviews. Starting with a website called Overlooked New York in which she has set out to interview “impassioned New Yorkers”, she began illustrating her interviews by painting portraits of the interviewees. The first of the series was an article, and multiple portraits, of the members of the Puerto Rico Schwinn Club, a group of adults with a passion for those great old Schwinns with their chrome fenders and chainguards, tricked out with mirrors and flags and decorations in the spokes. The cool bikes and the wonderful character of the member’s faces made for a terrific series of paintings, and started Saunders on the path to doing more portrait/interviews. Overlooked New York has maybe 25 or 30 stories on it now, most of which are about groups of one kind or another (Bike Messengers, River Swimmers, Subway Musicians, Kite Flyers, etc.) and feature multiple portraits. 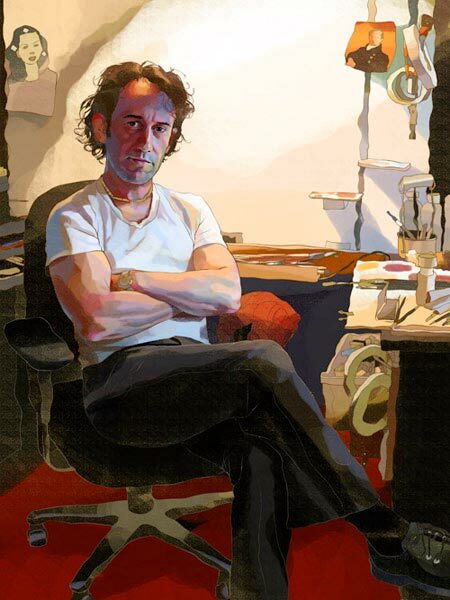 Of double interest to lines and colors readers is her series Both Sides of the Drawing Board in which she interviews and paints portraits of illustrators and art directors, including Tim O’Brien (image above) who I profiled last year. The series will be running in every issue of Illo magazine (which I wrote about back in May). You can find several examples from the series in the Reportage section of her web site. Her web site has a portfolio of her more general illustration, and children’s book illustration. There is an additional portfolio of her work on the site of her rep, Morgan Gaynin, Inc.
Saunders also maintains a blog on Drawger in which you can see preliminary sketches, work in progress and much larger detail images of her work. Zina Saunders is the daughter of Norman Sanders, who created many great pulp magazine and comic covers as well as classic trading card series like Mars Attacks (more on Norman Saunders in a future post). Zina Saunders paints the landscape of the face and figure as a series of rough edged planes, broken up into areas of often exaggerated or expressionistic colors and held within thin outlines. She sometimes surrounds them with sketch-like renderings of their environments, often with a wiggly-line style that I seldom like, but in her case works remarkably well. Saunders has a number of portraits of celebrities, but many of my favorites are among the “overlooked New Yorkers” and people simply going about their jobs, who she treats like celebrities. I’ve been changing and developing my approach for a while, but I guess it would be best described as “mixed media”. I sketch in pencil, and sometimes paint some of it traditionally and then scan and paint digitally on top of that. Sometimes I do all the painting digitally. Each painting is different, but that’s the gist of it. What medium does she use, I can’t tell from the work? Love the portraits. I asked Zina about her medium and approach and added her reply to the main post as an addendum.